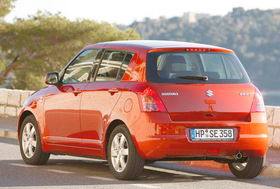 Suzuki builds the European Swift in Hungary. Dec 9 (Reuters) -- Volkswagen will buy a one-fifth stake in Suzuki for $2.5 billion, giving it access to the Japanese firm's expertise in small cars and dominance in India as it seeks to become the world's top automaker. Designs and manufactures passenger cars, commercial vehicles, motorcycles, all terrain vehicles (ATVs), outboard motors and other products. • Established as a loom maker by Michio Suzuki in 1909, Suzuki sold its first motorized bicycle in 1952 and its first passenger car, the 360cc Suzulight, in 1955. • Builds the world's fastest motorcycle, called Hayabusa, said to have recorded speeds of over 300 km (186 miles) per hour.